French chefs have a term fonds de cuisine, which translates “the foundation and working capital of the kitchen.” Bone and meat stock provide just that, the foundation of both the kitchen and ultimately one’s physical health. One of the most common questions that those individuals embarking upon the GAPS Diet have is “Do I make stock or broth?” What is the difference between the two? The two words are often used interchangeably by the most educated of chefs. For the purpose of the GAPS Diet, Dr. Natasha Campbell-McBride uses the terms “meat stock” and “bone stock.” In this paper, I will use “stock” when referencing shorter cooked meat stock and “broth” for longer cooked bone stock. Meat stock, rather than bone broth, is used in the beginning stages of the GAPS Diet, especially during the Introduction Diet where the primary focus is healing the gut. Broth is ideal for consuming once gut healing has taken place. The significant difference is that the stock (meat stock) is not cooked as long as broth (bone stock). Stock is especially rich in gelatin and free amino acids, like proline and glycine. These amino acids, along with the gelatinous protein from the meat and connective tissue, are particularly beneficial in healing and strengthening connective tissue such as that found in the lining of the gut. These nutrients are pulled out of the meat and connective tissue during the first several hours of cooking meaty fish, poultry, beef and lamb. The larger the bones, the longer the recommended cooking time. Bone broth, the longer cooked bones without the meat, is a superior source for minerals, as well as the same amino acids found in meat stock. The amino acids (with the exception of histidine) are present in higher amounts in bone broth. For certain individuals with leaky membranes in the gut and brain, the high concentration of glutamic acid may be problematic. Some people, including autistic children, have impaired liver function that causes the accumulation of ammonia in the blood and brain. Liver disease-associated brain damage has been linked to the accumulation of ammonia. In recent years, studies have shown that excess glutamine aggravates this condition causing brain injury. Russell Blaylock, M.D. advises that those with ADHD, autism, multiple sclerosis and other neurological disorders avoid excessive amounts of glutamates.1 Free glutamates include not only MSG but also glutamine and glutamic acid. These can potentially have a damaging effect on neurons in susceptible individuals. This is why I do not recommend using nutritional formulas containing glutamine in cases of the above-mentioned conditions, as well as Crohn’s or Leaky Gut Syndrome. Gelatin, a major component of meat stock, also assists in the proper digestion of proteins ensuring optimal growth in infants and children. It improves the integrity of collagen, which is reflected in the improved appearance of the skin as well as in the lessening of digestive tract inflammation. Additionally, gelatin enhances the digestibility of grains and legumes cooked in it. Both grains and legumes are eliminated in the beginning of the GAPS Diet, with grains avoided completely until one is ready to transition off the GAPS Diet. Once gut healing is complete and the digestive tract function is restored, properly prepared grains and legumes will be best enjoyed prepared using meat stock or bone broth. Broth or bone stock is introduced after the Introduction Diet when gut healing has advanced. Some with longstanding gut issues find that if they introduce broth (bone stock) early, prior to the sealing of the gut, they have reactions to the free glutamates that result from the longer cooked gelatin. Those who are sensitive to MSG will generally be sensitive to these free glutamates until their guts are healed. The timing on when a GAPS person is ready to progress to bone broth is individual. Those children who are autistic or ADD/ADHD and who are suffering from seizures, Tourettes or tics are among the people who should avoid free glutamates until their guts are healed and sealed. Once the gut is healed and sealed and the liver is working efficiently, these sensitivities typically go away. The formation of free glutatmates can be too excitatory for many sensitive individuals. Uncomfortable die off reactions, as well as symptoms of nervous system agitation, are signs that the digestive tract is best served staying with the meat stock. Die-off reactions can include diarrhea, vomiting, nausea, constipation and skin eruptions or rashes. Die-off symptoms can be managed or minimized by using old-fashioned therapies like castor oil packs and Epsom salt baths. Making the transition gradually from stock (meat stock) to broth (bone stock) is advisable. Cooking broth at a very low temperature (slow simmer) will minimize the formation of free glutamates. Lab analysis performed by Covance Laboratories, Madison, Wisconsin. For sake of comparison, both formulas used organically raised chickens from Mary’s. I had the bone broth analyzed for lead and levels were found to be >1.67 ppb, well within acceptable levels. There has been much speculation regarding the mineral content of bone broth. It has wrongfully been assumed in many instances that bone broth is naturally high in calcium. Actually this has proven not to be the case. There is ample antidotal evidence of expedited bone healing with the addition of generous consumption of bone broth but based on recent lab analysis it must be assumed that the bone healing power of bone broth has more to do with the synergistic aspect of all the minerals and amino acids and other nutrients present in bone broth. Further research is warranted to fully understand the positive and undeniable influence bone broth has on healing fractures and breaks in bones. *Lab analyses were performed by Covance Laboratories in Madison, Wisconsin. In Gut and Psychology Syndrome Dr. Campbell-McBride explains how to prepare stock (meat stock) to be used during the GAPS Introduction Diet. Her recipe can also be found at the end of this article. Stock prepared in this way supports good digestion, as well as promotes proper secretion of hydrochloric acid, which is needed for breaking down proteins in the stomach. Lack of adequate hydrochloric acid can lead to a myriad of symptoms including acid reflux, skin disorders, anemia, osteoporosis, rheumatoid arthritis, vitiligo, asthma, food allergies and more. Excellent broth (bone stock) recipes can be found in Sally Fallon’s Nourishing Traditions. This timeless cookbook should be in every kitchen. Broth is an invaluable addition to the diet of young children and all who desire optimal health. It is rich in minerals useful for building strong teeth and bones. Broth serves as a good replacement for milk in the diet of those who are lactose intolerant. However, in most cases we find that once the gut is healed, raw milk is well digested. Regardless, once homemade broth is introduced, it will be a welcomed staple to your diet. Both stock and broth can be made from the same bones. It is simple to begin your stock and after cooking for several hours, remove the carcass for deboning. Reserve the meat for eating and then return the bones to the pot with fresh water. Continue cooking for 6 to 48 hours, depending upon the type of bones. Stock and broth can be stored in the refrigerator for several days with the layer of fat on top to prevent oxidation or frozen in the freezer for several months. Unused stock or broth in the refrigerator may be reheated, cooled and returned to the refrigerator for several more days before consuming. Meat stock and bone broth add valuable nutrients and flavor to every meal. For those who have experienced gut healing from the GAPS Introduction Diet, both should be enjoyed freely and often. 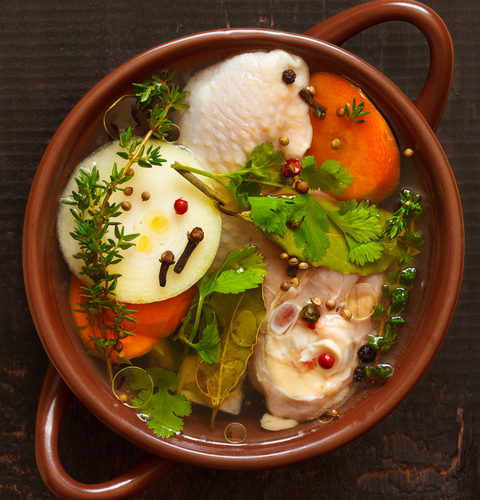 As every experienced chef knows, stock and broth add a welcomed savory taste to meats, grains, legumes and vegetables as they stimulate the appetite and supports good digestion. Bon appétit! For those following the GAPS™ Intro Diet, do not include fibrous vegetables in meat stock recipes. This includes celery, broccoli and cauliflower. Do not use any potatoes during any stage of the GAPS™ Diet. When using squashes, remove skin and seeds. Rinse fish in purified water. Remove meat from the fish and reserve for cooking. Place bones, fins, tails, skin and heads in the pot. Add remaining ingredients. Fill pot with purified water. Bring to a boil. Reduce the heat to a simmer and cook for 1 to 1 ½ hours. Add parsley and salt during the last 10 minutes of cooking. Remove the fish bones and other large parts. Strain the stock. Set aside remaining ingredients for preparing fish broth (fish bone stock). Rinse chicken, feet and heads in purified water. Cut whole chicken in half down the middle lengthwise. Place these in the pot. Add remaining ingredients. Fill pot with purified water. Allow the pot and its contents to stand for 30 minutes, giving the raw apple cider vinegar time to draw minerals out of the bones. Bring to a boil. Reduce the heat to a simmer and cook for 1 ½ to 2 hours. Add parsley and salt during the last 10 minutes of cooking. Remove the chicken and other large parts. Debone and reserve the meat for eating. It will be delicious. Strain the stock. Set aside remaining ingredients for preparing chicken broth (chicken bone stock). Place the bones, meat and joints into a large pot. You may roast the meaty bones in a pan in an oven at 350 degrees Fahrenheit. You may roast the meaty bones in a roasting pan until well browned, for extra flavor. Place these in the pot. Add remaining ingredients. Fill pot with purified water. Allow pot and its contents to stand for 60 minutes, giving the raw apple cider vinegar time to draw minerals out of the bones. Bring to a boil. Reduce the heat to a simmer and cook for 3 to 4 hours. Add parsley during the last 10 minutes of cooking. Debone and reserve the meat for eating. It will be delicious. Strain the stock. Set aside remaining ingredients for preparing beef or lamb bone broth. Avoid adding starchy vegetables to your stock. Place all ingredients in a large stock pot or slow cooker. Leave at room temperature for 30 minutes, allowing raw apple cider vinegar to act on the bones, drawing out the minerals. Bring to a boil. Skim and discard any scum that may surface. Lower to a slow, surface simmer (tiny bubble on the surface) and allow to cook for 4 to 6 hours. Strain broth. Allow to come to room temperature. Then cool in the refrigerator. If freezing, be sure to leave 3 inches of airspace from broth to lid. This allows for expansion as the broth freezes. Place all ingredients in a large stock pot or slow cooker. Leave at room temperature for 30 minutes, allowing raw apple cider vinegar to act on the bones, drawing out the minerals. Bring to a boil. Skim and discard any scum that may surface. Often pastured chicken produces no scum. Lower to a slow, surface simmer (tiny bubble on the surface) and allow to cook for 6 to 24 hours. Place meaty bones on a baking sheet or in a baking dish and roast at 350°F for about 30 minutes, until browned. While meaty bones are roasting, place other bones and all other ingredients in a large stock pot or slow cooker. Leave at room temperature for one hour, allowing raw apple cider vinegar to act on the bones, drawing out the minerals. Once meaty bones are roasted, add them along with their juices, to the pot (or slow cooker). Bring to a boil. Skim and discard any scum that may surface. Often pastured meats produce no scum. Lower to a slow, surface simmer (tiny bubble on the surface) and allow to cook for 48 to 72 hours. One Response to Stock vs. Broth: Are You Confused?